Pilates Equipment - The Best of New York Pilates! 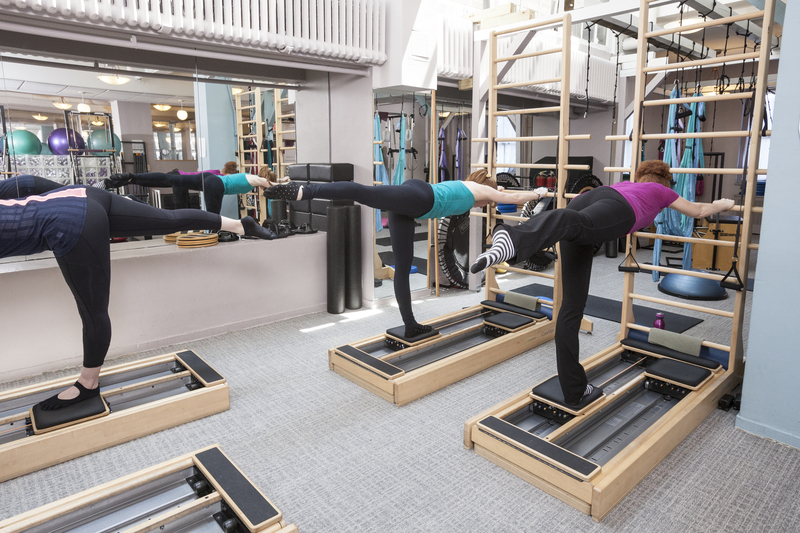 Group equipment classes are offered in Pilates Reformer & Chair, SilkSuspensionTM and CoreAlign®. To provide the best instruction we can, we limit our class size to five students or less! Read about classes offered below! SilkSuspensionTM -- Core strengthening in three dimensional movement with suspension exercise is one of the best ways to target the deep muscles of the body. So fire up your core with SilkSuspensionTM, the ultimate in suspension and sling training, unique to Pilates on Fifth! SilkSuspensionTM provides the best in functional cross training with this intense and focused class. Like all of the group equipment classes at Pilates on Fifth, SilkSuspensionTM is appropriate for all fitness levels. The SilkSuspensionTM equipment can be adjusted instantly to meet you at your personal (unique) level.... you'll always be working your edge, which is ideal for building strength both optimally and safely. And because of the nature of the exercise, your heart rate will stay elevated throughout, keeping you in a great fat burning zone for the duration of the class. Moreover, because the unique attributes of double suspension points create controlled instability, your inner joint muscles get stronger, which also help to alleviate pain. You might need to try it to believe it, but if you need more convincing, there's a link coming soon for some testimonials! Learn more about SilkSuspension™. CoreAlign® -- How do we move through life? Vertically! CoreAlign® brings Pilates principles vertical with functional, posture-improving, muscle toning exercises that leave you walking taller and feeling great! Exercises are performed on two independently moving carts that simulate the way we move through life...on two legs! These exercises increase range of motion, improve balance and posture and most importantly, improve biomechanics so that overall movement patterns improve. Just like Pilates, proper execution of the movements is the key to reaping all the benefits of CoreAlign, so be sure to try a few classes! This group equipment class is limited to four people, so sign up early! Learn More about CoreAlign®.